How many Oreo cookies have you eaten in your lifetime? If you are anything like me, you probably don’t want to know that question’s answer. More than 491 million bags have been sold to date—a generous fraction were probably purchased by me. But for all the gustatory pleasure given by the cookies, have you ever slowed down and appreciated the intricately “embossed” design on the cookie biscuit? I hadn’t either. Apparently there’s quite a back story. 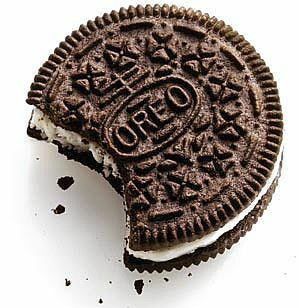 [T]he Oreo’s geometric pattern of a dot with four triangles radiating outward is either a schematic drawing of a four-leaf clover or—cue the cliffhanger music from Jaws—the cross pattée, also associated with the Knights Templar, as well as with the German military and today’s Freemasons. Twilley also explores some of the industrial, cultural, legal, and spiritual dimensions of cookie-embossing. Sweet! Image by nicoleleec, licensed under Creative Commons.